Most visitors to Greece want their trip to include, or even to be devoted to, the islands, but may initially be bewildered by their number and variety. In order to sort out these islands' diverse attractions, here is a high-level overview of them; the characteristics of each group will be summarized on their regional pages with further descriptions on the links to the individual islands. Also below there are some suggestions which may be helpful for travelers in getting an idea of which islands they may find most appealing. 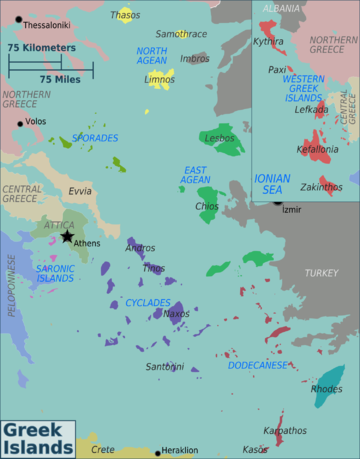 Note that Crete is not included on this page since due to its size and importance it's described as a separate region, and the island of Evvia is so large and so closely associated with the mainland that it's considered together with the mainland areas of Central and Northern Greece rather than being included in the above list. Also, a few small offshore Greek islands are described on the pages of the mainland areas they are close to. What follows is by no means a complete list of island attractions, but is meant as a starting point to help travelers to the islands, especially first time ones, decide which islands might repay further investigation. Islands top ranked in their category are given first, followed by an also listing of others that rank highly in the category. Islands with great beaches: Mykonos, Naxos, Thasos, Rhodes, Skiathos, Skopelos; also Kos, Lefkada, Serifos, Milos, Corfu, Kefallonia. Islands with significant archeological sites and museums: Delos, Rhodes, Aegina, also Kos, Samos, Thasos, Lesvos. Great island harbor towns: Chios, Hydra, Symi, Naxos, Rhodes, Mykonos, Skopelos, also Syros, Corfu, Lefkada. Great island medieval towns and fortresses: Corfu, Rhodes, Sifnos, Serifos. Lots of night life: Ios, Mykonos, Santorini, also Skiathos, Rhodes, Corfu, Paros, Zakynthos. Good for walking: Samos, Sifnos, Kefallonia, Tilos, also Andros, Skopelos. Significant connection with early or Orthodox Christianity: Patmos, Tinos, also Chios, Milos. Impressive landscape: Santorini, Nisyros also Naxos, Milos, Syros, Skopelos. Closest to Athens: Saronic Gulf Islands, also Serifos, Sifnos, Milos. Best access by airplane: Rhodes, Santorini, Mykonos, also Lesvos, Chios, Kos, Samos, Corfu. Islands with luxury hotels or resorts: Rhodes, Santorini. Often, though not always, the main town of a Greek island will have the same name as the island; thus, Naxos is the name of the main town on Naxos, and Paros is the name of the main town on Paros. Sometimes these towns also have alternate names; thus Paros town is sometimes known as Parikia. In addition to these names, the main town on an island is often also referred to locally on the island as Hora (sometimes spelled Khora), which basically means "the place": thus "Hora" on Naxos means Naxos town, while "Hora" on Paros means Paros town. The best way to get around between islands - you already guessed - is by boat. Ferry schedules can be found at  or . The main difference is that openseas can do a X to ALL search, which gives you all ferries departing from island X on a certain day which can be quite handy. Unfortunately this does not work (yet?) for Piraeus. This page was last edited on 22 June 2016, at 09:28.